Describing himself as a fighter, Adams, who is the National Coordinator of the Oodua Peoples Congress, added that he would reach out to a former Lagos State Governor, Asiwaju Bola Tinubu, and other Yoruba leaders. The OPC leader said this in Lagos while speaking with newsmen on Tuesday. Adams stated that though he was not as wealthy as the immediate past holder of the title, the late Chief M.K.O. Abiola, whom he said he had a high regard for, he was ready to use his structure to advance the socio cultural cause of the Yoruba. "I am not as wealthy as the last Aare Ona Kakanfo, but the structure I have today with six million followers is something that cannot be wished away. "I am going to be a bridge builder and promote the unity of the Yoruba race. I will reach out to people who will help to move the Yoruba race. 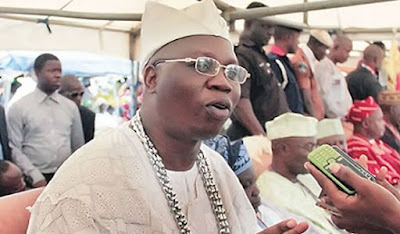 I am going to reach out to Asiwaju Bola Ahmed Tinubu and other Yoruba leaders” Adams said. He said contrary to popular belief , the title was not a death knell for anybody chosen as the Aare Ona Kakanfo. "Most men given the title were war generals. The myth that all the Aare Ona Kakanfo ended in tragedy is not true. We shouldn't allow such a myth to cast a shadow on the good office of the Aare Ona Kakanfo. "I am a fighter. You must understand that death is a product of God. I have been fighting for many years and will work to promote the Yoruba agenda” he added.